The host hotel for this year’s show is once again the LVH, (formerly The Las Vegas Hilton). We are excited and inspired to have The Las Vegas DJ Show at such an upscale, gorgeous property. This is a premium property with plenty of onsite entertainment & dining options. As in past years, there will have food available for sale, right outside of the seminar rooms and exhibits in the convention center. Tables and chairs will be set up for plenty of networking with friends. 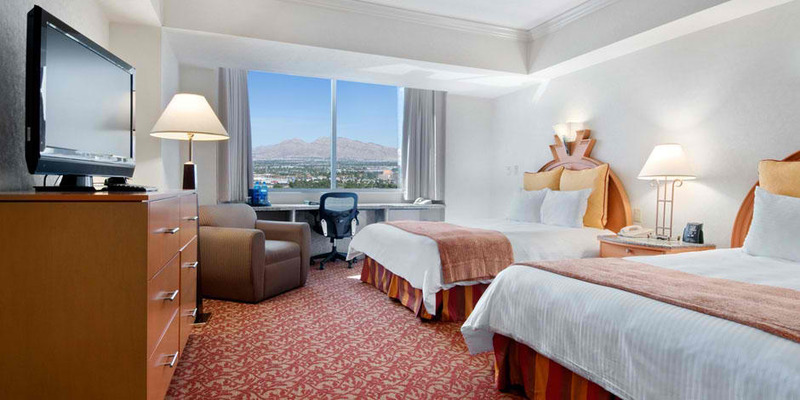 The LVH is a wonderful place to bring your spouse or family with you. It is a family-friendly resort. The weather will be incredible, the strip will be jumping & the entertainment first class. At the LVH the Restaurants are fabulous! The Paradise Cafe, is open from early morning to get your day off on a running start to late at night for dinner of a snack after a show. No being relegated to the food court at 2pm. The food court is however, filled with name brand eateries, so you can know the quality will be there. For those looking for a more ambiance filled dining experience, there are several choices that will be open for your dining pleasure starting with Vince Neil’s Tres Rio’s Cantina. This is some of the best Mexican food on the strip. There is fine dining at TJ’s Steakhouse, The LVH Buffet like no other, It’s an Old school Vegas Buffet, All you can eat, stocked with all the finest foods. Shrimp, steak, Chicken, everything you expect from a top quality Vegas Buffet. Casa Nicola, and of course there is Benihana’s. The ultimate Japanese Steakhouse. 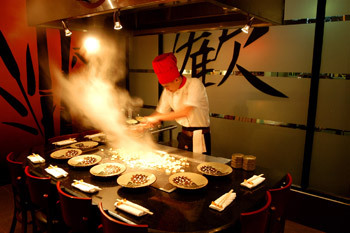 Your meal is literally prepared for you table side with fire, whirling knives & an entertaining display that is as exciting as the food is delicious! All show attendees staying onsite at the LVH under the show room block qualify for a $100 discount food & beverage package. For More images & videos of our tremendous host hotel please check out this link! Here is a map of where the action will take place. Rooms N109 – N113 will be the seminar locations and exhibits will be in C4. This code can be input online when you click on the Budget logo (above) or mentioned to reservation agents when booking by phone.